Loki Laufeyson is running for the political office in an apparently legitimate attempt to get elected to the White House. Vote Loki may not be accurately reflecting the process to elect a US President, but as a Brit living in Canada, I’m not exactly an expert on the US political system. Needless to say, if there are any factual inaccuracies on that front I’m not the man to point them out, so I’m not even going to try. What I will talk about, however, is whether the comic is a fun read, or if it’s better left on the shelf. I picked up the first issue simply because I had, effectively, some money on a gift card, and the comic looked like the tongue-in-cheek story I wanted to read. I thoroughly enjoyed that issue and felt that there was enough of an explanation of how Loki could run for President that it didn’t feel too forced. Was it accurate? I honestly don’t know, but for me, Christopher Hastings explanations answered the questions I had (I did know that only a US born person could be elected President thanks to Governor Schwarzenegger). Perhaps one of my favourite aspects of the first comic was the way in which Loki so effortlessly turned the media to his purposes, twisting words and, oddly enough for the God of Mischief, telling the truth. It’s a fantastic look at how the character could use his silver tongue if he were to really put his mind to it. In the Marvel Universe at least, Loki is becoming a legitimate contender for the White House, and he’s doing it all with only the slightest hint of any magic. Hastings is depicting a world where people are fed up with the half truths and lies of politicians and have turned to Loki’s strikingly honest way of openly lying to your face as the preferred alternative. It certainly makes for a very enjoyable comic, if not entirely possible; Loki being a Norse God aside, I’m unaware how feasible a campaign such as Loki’s would actually be – but I also don’t care. Vote Loki #2 was every bit as enjoyable as the first issue and is fast becoming one of my favourite comics each month. That it’s only a four issue miniseries is a shame, but I’d rather this end on a high note than have Marvel drag the story out into irrelevance and boredom. Vote Loki #2 continues to follow journalist Nisa Contreras, who is ultimately the true protagonist of the series, and it’s through her eyes that we witness the country getting swept up in the madness that surrounds Loki. Why wouldn’t the Avengers intervene in such a bold and drastic attempt to gain the Presidency? 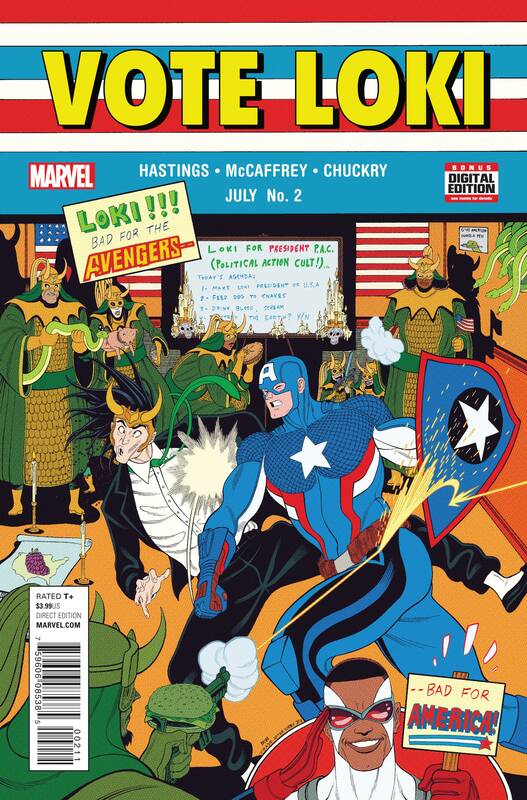 That’s a question answered early in this issue, and with a surprisingly logical answer: the Avengers don’t interfere in the political sphere, and Loki‘s not doing anything illegal, so there’s really nothing they can do. This comic won’t be for everybody – and it’s certainly arguable as to whether it will hold up over time – but right now, this is an enjoyable series that’s won me over.